To Properly Uninstall iTunes I Need To Uninstall How Many Programs? Those are cute, but something similar and not as funny came to mind when I saw Apple’s instructions about how to properly uninstall iTunes on this Apple support page. 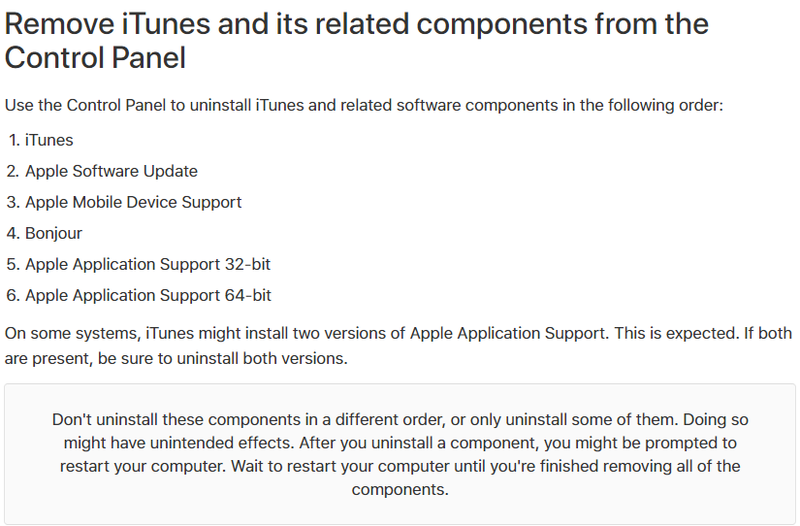 If you have to uninstall 6 programs to fully uninstall iTunes, Apple may have a problem! Six, wow! Not only that, but it must be done in a particular order to avoid “unintended effects”. Keep in mind, some of these take several minutes to uninstall. This process is not quick. There are many more “complex” programs that would require less from their customers. If you are lucky then simply uninstalling iTunes will take care of your issue but if it doesn’t, hopefully jumping through Apple’s hoops will.